I took my sketchpad with me to the Kruger with an array of charcoal, pencils and pastels. I have managed before to do some really nice gesture drawing of wildlife but …. I haven’t done this or any drawing in quite a while and my hand froze when it saw the paper. I needed the animal to stay still – something that was not going to happen. The only animal I managed to sketch was the Impala becuase if the one I was drawing moved, there would be another in the herd that was standing in the same position. I really enjoyed doing this sketch – you see and notice things you would ordinarily not. For example, the female Impala has a black diamond on the top of their head. 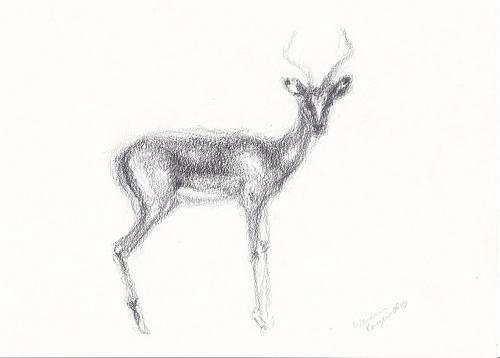 This entry was posted in Blog and tagged animals, gesture drawing, impala, sketching, Wildlife.